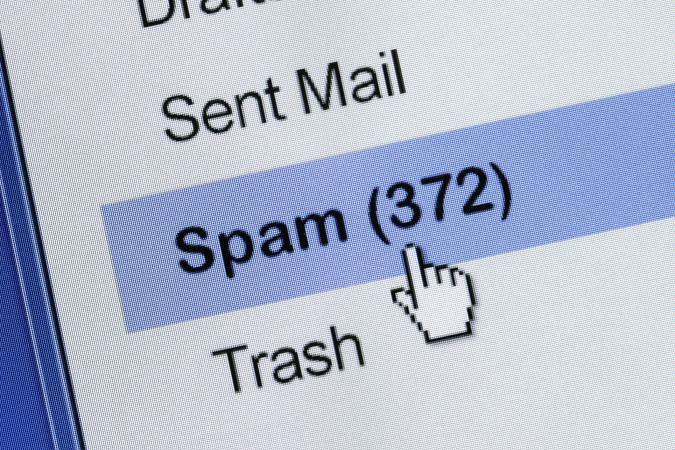 As much as two-thirds of all email sent globally is spam. To minimize the impact on productivity and to ensure your security, a great system for filtering spam is positively critical. Several options exist across a variety of platforms, including many solutions for web-based email. MailWasher Pro 2010 (just under $30), a winner of the TuCows 5 Cow rating, is easily installed and set up in less than a minute. It is available in two versions; the older version requires fewer system resources than the newer version which requires 1 GB of system memory. 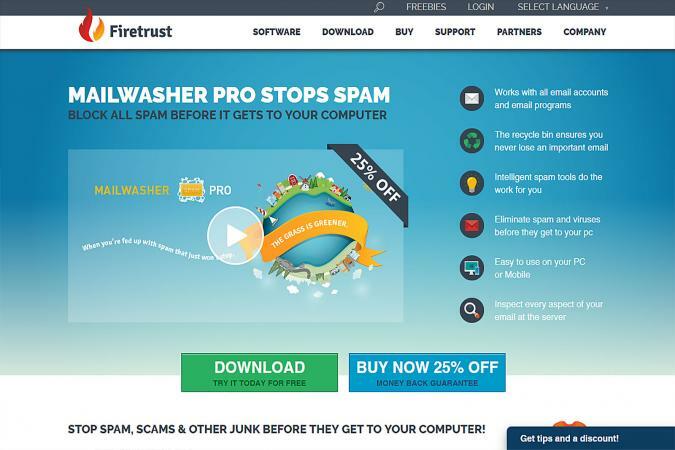 In addition to being a great spam blocker, MailWasher Pro 2010 also protects you from phishing attacks, identity theft, malware/spyware, and viruses. Both IMAP and POP3 protocols are supported, so you can use any of the popular e-mail clients and webmail services including Outlook Express, Thunderbird, Hotmail, and Yahoo. MailWasher Pro uses a combination of community-based filtering and Bayesian filtering. The more you use it, the better it gets at its job! Community-based filtering blocks spam based on the information provided by users of the application. When you receive spam, you report it and it is added to a database. The combined efforts of all users block similar messages for everyone. Bayesian filtering is a probability-based filtering system. The Bayesian filter collects words, IP addresses, and domains from both valid email and spam. This is a "training period." It places email in your spam folder based on the probability that a word occurs in spam rather than valid email. Because this spam blocker automatically imports your contact list and places senders on the blacklist or whitelist, it's easy for you to block messages from certain senders while letting legitimate messages get through. You can choose from multiple support options including an FAQ/Knowledgebase, support forum, email/contact form, and support ticket system. Unfortunately, there is no telephone support. SPAMfighter Pro (around $30) is a Microsoft Gold Certified Partner that is not only easy to install and set up, but it is also user-friendly. Count on it to block as much as 95% of spam and to protect you against malware/spyware, identity theft, and viruses. SPAMfighter Pro blocks most spam messages while ensuring you receive legitimate email messages. The community-based filtering system is efficient, saving you time and increasing security on your devices. A combination of a community-based filtering system and Bayesian filtering system (probability-based) would be more effective. SPAMfighter Pro works well as a standalone app, but it also integrates seamlessly with POP3 email clients such as Microsoft Outlook, Windows Mail, and Thunderbird. If you use an IMAP email client or service, you will need to retrieve your email via a POP3 email client. Compatible operating systems include Windows 7, 8, 10, Vista and XP. The community-based filtering method allows you and other users to report spam to an online database. Contributions to the database automatically block future spam messages. SPAMfighter automatically adds your contact list to a "friends list," messages received from which are ignored. Any messages or domains you add to the "enemies list" are automatically blocked. Legitimate emails get through. Should you require support, SPAMfighter has all the bases covered. Find your answers through the FAQ or ask for further assistance via the support forum, contact form, telephone support or by opening a support ticket. A 2011 SC Magazine Awards finalist, Cloudmark DesktopOne Pro (free) takes less than two minutes to install and set up. It blocks spam messages and protects you from phishing attacks, identity theft, malware/spyware, and viruses. 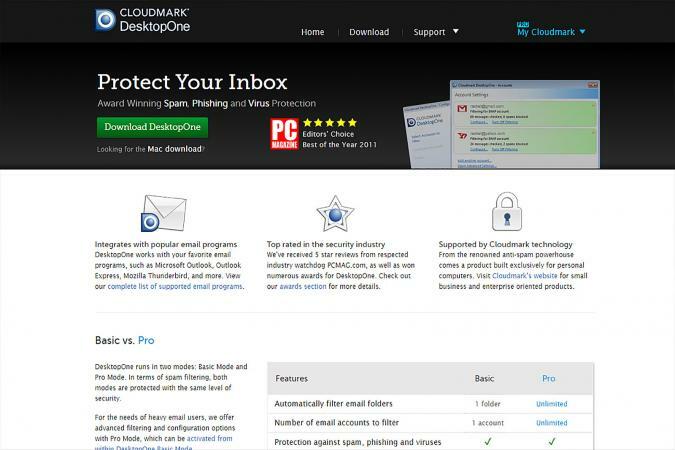 Cloudmark DesktopOne Pro effectively manages your inbox deleting most spam. It works whether your email client is open or closed. The community-based filtering technique is effective, but the chances of false positives would be lessened with the addition of Bayesian filtering. With support for both IMAP and POP3 protocols, Cloudmark can be used with any of the popular email clients or webmail services including Microsoft Outlook, Outlook Express, Thunderbird, Hotmail and Yahoo. The DesktopOne toolbar seamlessly integrates with any of these email clients and webmail services. Whether you are a PC user or a Mac user, your operating system is compatible with Cloudmark DesktopOne Pro too. The community-based filtering feature ensures that spam does not reach you or other users. It is a very effective method on its own, but it is possible for some email to be mistakenly categorized as spam. Bayesian filtering would be a great addition to an already effective spam blocker. Support for Cloudmark DesktopOne Pro can be reached through a forum, email, or telephone, as well as by submitting a support ticket or reading through the knowledge base. User-friendly and easily installed, ChoiceMail One (about $30) is a winner of the 2016 Top 10 Review Award. It provides effective spam protection and goes beyond to protect you from phishing attacks, identity theft, malware/spyware, and viruses. Unfortunately, it does not block attachments. Consequently, an infected attachment from an approved sender would get through. ChoiceMail One is compatible with email clients such as Microsoft Outlook and Thunderbird. It supports POP3 protocols, but not IMAP, so you must access your webmail accounts via a POP3 email client. It is compatible with Windows 7, 8, 10, Vista, and XP. ChoiceMail One is a permission-based spam blocker and, once installed, automatically syncs with your email client. You are in total control of which emails are blocked and which are sent to your inbox. Messages from unknown senders are placed in quarantine pending sender verification by you on the ChoiceMail One website. Should you need support, you can choose from multiple options including the FAQ/Knowledgebase, forum, telephone support, and support ticket system. Providing a high degree of spam protection without blocking any legitimate email, iHateSpam (just under $45) is a winner of the 2016 Top 10 Review Award. You are protected from phishing attacks, identity theft, malware/spyware, and viruses too. iHateSpam supports both POP3 and IMAP protocols. You can use it with email clients such as Microsoft Outlook and Outlook Express or webmail services such as Hotmail or Eudora. Compatible operating systems include Windows 7, 8, and Vista. The community-based filtering feature is very effective at blocking spam without eliminating valid email. You can also customize language filters to block emails written in foreign languages. While there is no phone support with iHateSpam, you can get help through email or in the support forum, as well as the FAQ. Installing in less than three minutes, Spam Bully (about $30/year) has received a 2016 Top 10 Review Award. It is user-friendly and in addition to providing excellent spam protection, it also protects you from malware and spyware. 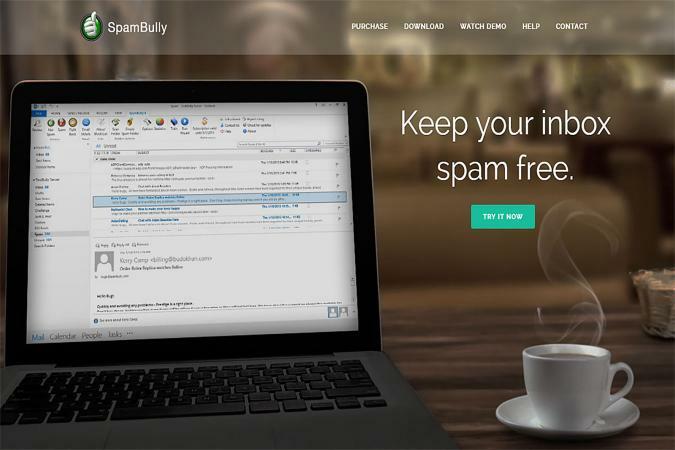 Spam Bully is compatible with Microsoft email clients like Outlook, Outlook Express, and Windows Live, as well as Mozilla Thunderbird. Support of IMAP and POP3 protocols is dependent on the version you use. For example, the IMAP protocol and Hotmail only work in the Outlook version of Spam Bully 4. If you need Hotmail and IMAP support in Outlook Express, you will need Spam Bully 2. Spam Bully is compatible with most versions of Windows. Spam Bully syncs with supported email accounts providing you with detailed statistics on all incoming email messages. It uses a Bayesian filtering technique to sort incoming messages. This probability-based filtering system identifies and analyzes words, character strings, and embedded links associated with spam. The more email you receive, the better the filter works. Find the answer you need on your own by browsing the FAQ or reach the technical experts directly via the email contact form. Earning a 5 Cow rating on TuCows, SpamEater Pro (around $25) "eats" as much as 95% of spam in your inbox. It also protects you from phishing attacks, viruses, and other malware and spyware. Supporting both POP3 and IMAP protocols, SpamEater Pro is compatible with all popular email clients and webmail services. No matter what you use - Microsoft Outlook, Thunderbird, Hotmail - you will have no conflicts associated with this spam blocker. OS support includes Windows 7, 8, 10, Vista, and XP. Probability-based filtering sorts incoming messages and blocks most spam. SpamEater Pro processes each email checking for words, character strings, and embedded links before you download it. This feature allows the application to learn with each email you receive. Some people prefer one support option over others. There is no phone support, but SpamEater Pro does provide you with an FAQ/Knowledgebase and email/contact form. A great anti-spam solution is critical to increasing your productivity and security. While no spam filtering program is 100% effective, you should be able to expect spam protection that does not block legitimate email messages, as well as compatibility across multiple email clients, services, and operating systems.